“Sometimes the light’s all shinin’ on me,” says The Grateful Dead, “other times I can barely see.” I often speak of the Fool’s journey. One way of looking at this journey is to divide the majors into three parts, three sub-journeys of cards #1-7, #8-14, #15-21. Not being very hierarchical, or very linear, and having spent more time thus far at the end of the road than anywhere else, I begin with the final phase. Some of you may have read my blog posting regarding the three black major cards, entitled “Tarot 13, 15, 16: A Bad Day In Hell Is Just An Ordinary Tuesday Here.” In that posting you will find some discussion of how our journeying Fool, following a total transformation of Death, had entered into the deep underworld of the Devil card. The third stage of the journey begins in this darkness from which the Fool only slowly emerges. “One of these days,” sings The Dead, “they know they’d better get going, out of the door and down on the streets all alone.” Reminiscent of the Lovers card, we see the same three characters on the Devil, but the center figure is no angel, he is someone who can burn fire upside down and thinks he can chain Adam and Eve to his throne. 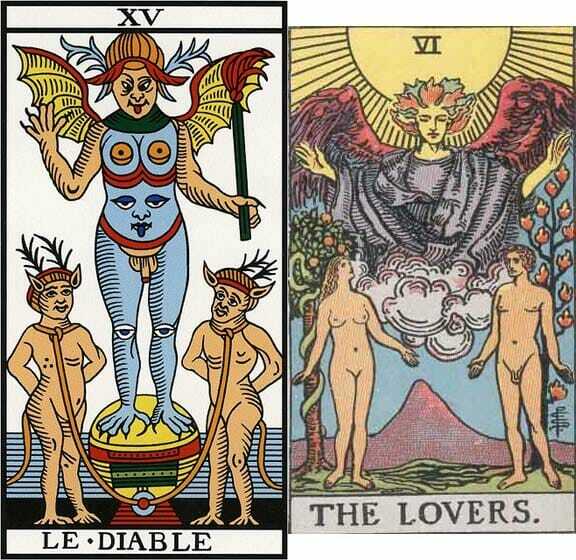 In older times the Lovers card used to be named Choice, where young man had to choose between his mother and his young woman as part of the growing up process. In the Devil card another choice is to be made, this one the exercise of free will to remove the heavy chains hanging loosely around the neck and to get going out of the door and down on the streets all alone. This is not necessarily an easy choice, because all alone can feel so much more frightening than any companionship, even the evil companionship of enslavement. But to get out of the dark, it’s got to be done. “Hang it up,” advises The Dead, “and see what tomorrow brings.” Escaping from the devil doesn’t immediately bring sunshine and roses. First we have the long fall from that burning Tower, the destruction of what man has created. This isn’t recovery from illness or freak of nature, this is the painful fall not from heaven but from manmade hell. “Arrows of neon,” says The Dead, “and flashing marquees out on main street.” The Tower card certainly pictures war, though the war may be with one’s self. After the enveloping darkness of the devil the flashing light can hurt our eyes. When the tower falls, everyone falls, from the King down to the ordinary man. The crown, symbol of supreme power, is blasted from its place. Being expelled from the tower is certainly one way to get you down on the streets. “Get out of the door,” says The Dead, “and light out and look all around.” After the tower we encounter three cards of celestial light, from the dimmest to the strongest. The Star, reminding us of Temperance, allows us to quench our thirst and regain our balance. The Moon sets us back on our intuitive path to our internal goals. Finally the Sun is a childlike rebirth into glorious light and air. Now we’re in clover. “Trouble ahead,”The Dead tells us, “trouble behind.” Just when we think we have everything in hand we are suddenly pulled through another transformation when we are called to Judgement. Out there in the Sun it didn’t occur to us it might come to a crashing end. Or is it an end? This is trouble ahead, and then the trouble is behind us. In this transformation we are already rising from the dead, out of our coffins, called by yet another angel, readying ourselves for the next big reward. Then God way up in heaven, for whatever it was worth,” says The Dead, “thought He’d have a big old party, thought He’d call it planet Earth.” Reminding us quite a bit of the Wheel of Fortune, we see the four corners anchored with symbols of the four fixed astrological signs of Leo, Taurus, Aquarius and Scorpio. These signs represent the four elements, which at the beginning of the journey we saw laid out on the Magician’s table. Now the World dancer has total control over these elements and, wand in hand, can use them to do her bidding. “Lately it occurs to me,” says The Dead, “what a long, strange trip it’s been.” Of course the world is not just an end, it is also a new beginning. Poised like the Fool, the dancer is ready to step through the laurel wreath, sometimes described as a universal birth canal. She emerges as the Fool once again, newborn and ready to begin a fresh cycle of the journey. The opening cards are from the Waite Smith deck. 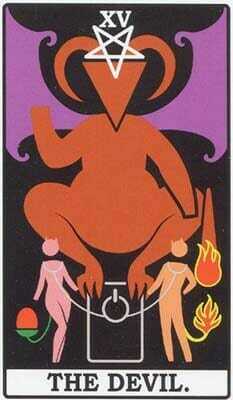 The first Devil card is unattributed. Information is welcome. The Lovers card is from the Waite Smith deck. 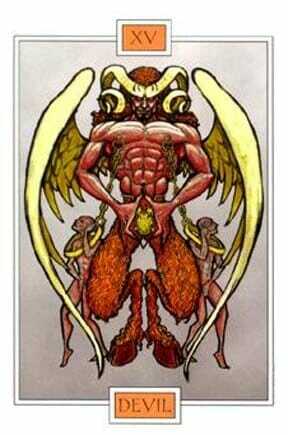 The second Devil card is unattributed. Information is welcome. 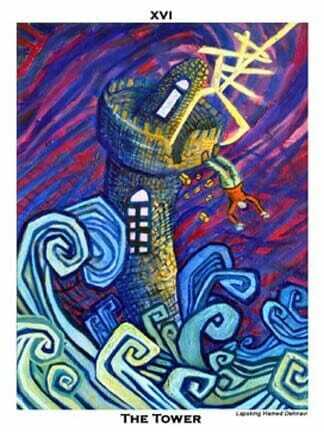 The first Tower card is from the Thoth Tarot deck. The second Tower card is by Lapsking Hamed Dehnavi. 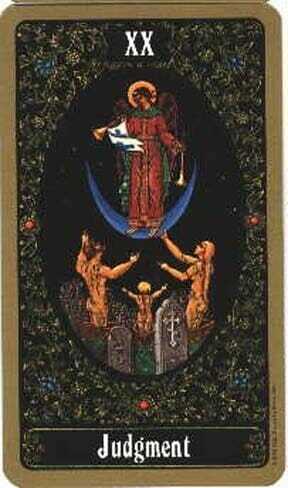 The Temperance and Star cards are from the Waite Smith deck. The Moon card is from the Moon Garden deck. 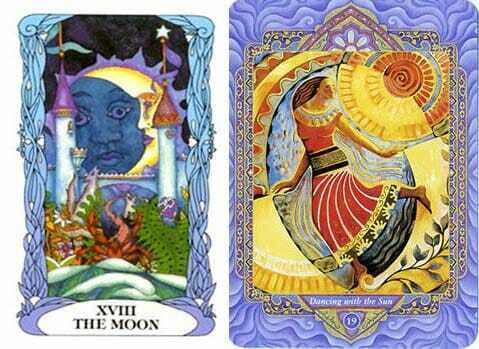 The Sun card is from the Triple Goddess deck. 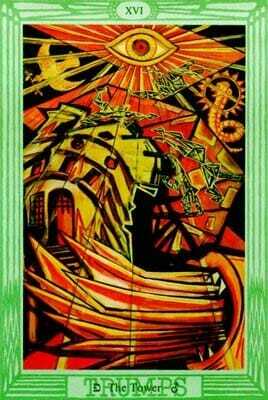 The Judgement card is from the Russian Tarot of St. Petersburg deck. The World card is unattributed. Information is welcome. 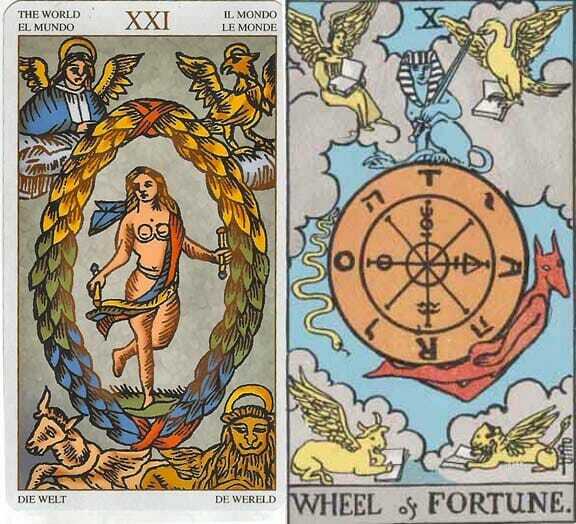 The Wheel of Fortune card is from the Waite Smith deck.